This 6-day plan is designed to help you lose between 3 and 5 kg in a healthy way, with the help from weight-loss accelerators derived from ingredients with proven effectiveness. They work from the inside to help your body to accelerate and sustain both weight loss and the effects of your reset therapy. For a period of 7 days, starting on the first day of juice therapy, you should drink this highly effective fat burning accelerator (on an empty stomach): fresh ginger, super detox effect and revitaliser. What are the results? Fat burning effect, improving digestion and boosting your body’s defences. Start your plan with a complete body cleanse, losing volume & weight and resetting your body. 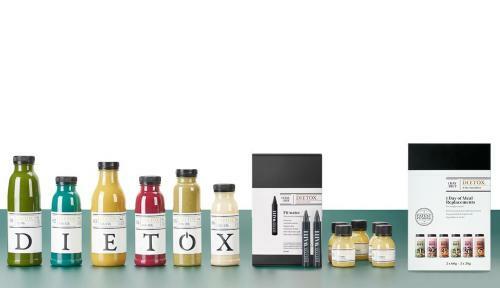 Our juice therapy involves a period of semi-fasting, in which you consume 6 specially designed dietox recipes, spread out throughout the day (4 fresh juices and 2 vegetable cream soups which can be consumed cold or warm), following the order and time frames indicated on each bottle. During this fasting period, you should not consume any solid foods in order to allow your digestive system organs to rest properly. What are the results? Feel lighter, livelier and better rested. Continue your reset with our hypo-caloric vegan smoothies, made from vegetables, fruit and super foods, which have been specially designed to allow you to concentrate on weight loss, without constantly feeling hungry. 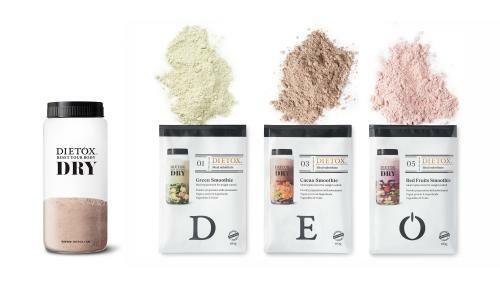 You will consume 5 smoothies a day over the course of 3 days, with 3 delicious flavours to choose from. Each smoothie provides a total calorie intake of 860 kcal. They are easy and quick to prepare, as well as being hypo-caloric, meaning they are guaranteed to make you feel fuller for longer! What are the results? Weight-loss without the dreaded rebound effect, offering your body complete nutrition with minimum calories. What are the results? Weight loss, elimination of excess liquids, muscle toning. Content: 3 days' worth of juices (12 juices and 6 cream soups) + 3 days' worth of Smoothie Meal Replacement Diet (15 dry smoothies) + 1 Fit Water (bottle not included) + 7 Fresh Ginger Shots + 1 portable cooler + 1 shaker. Our juice blends are so fresh that we recommend they be consumed within 6 to 7 days of the date of delivery. You can choose the delivery date in our calendar before making the payment. Achieve your goal weight (lose up to 5 kg). You should store your Fresh Ginger Shots in the fridge and consume one shot per day for a period of 7 days. Shake well before opening. You should not consume any solid foods during these 3 days. 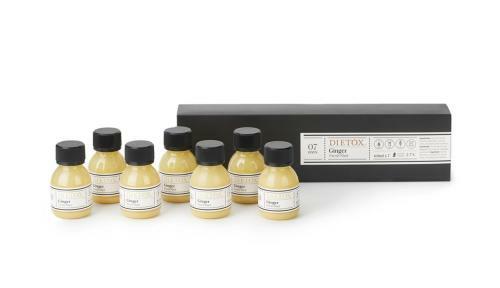 Only drink your Fresh Ginger Shot and your juices, following the order and timeframes indicated on each of the bottles. For the 3 days following your Fresh Therapy, you should continue to take your Fresh Ginger Shot (on an empty stomach) but you will replace your main meals and snacks with powder-based smoothies. Open your DRY sachet (main meal: 60 g, Snack: 30 g) and empty the contents into the shaker, making sure to close the lid firmly.